Grains and roasted veggies are a classic combination, one that I like a lot and shows up at our table on a regular basis. But lately I’ve incorporated a small extra step into it, and it is a game changer. Interesting expression, by the way. From my “foreign perspective”, it is not necessarily a good thing. After all, if the game is going well, a game changer would ruin it. But the term, adopted by the Oxford dictionary very recently (2012), always has a positive connotation. Which makes it perfect to describe the addition of fresh veggies right before serving this dish. Game-changing. I promise. Fill a large pot with salted water and bring to a boil. Add the farro and cook (as if cooking pasta) until al dente. Cooking time will depend on many factors, start checking at 25 minutes, it might take 40 minutes or a tad longer. When cooked to your liking, drain and reserve. Coat the carrots with a bit of olive oil, season with paprika, salt and pepper. Roast uncovered in a 420F oven for about 30 minutes. Meanwhile, prepare the asparagus. Lay they on a microwave-safe dish, season very lightly with salt and sprinkle with lemon juice. Add a paper towel on top to cover them lightly. Microwave for 2 to 3 minutes. Reserve. 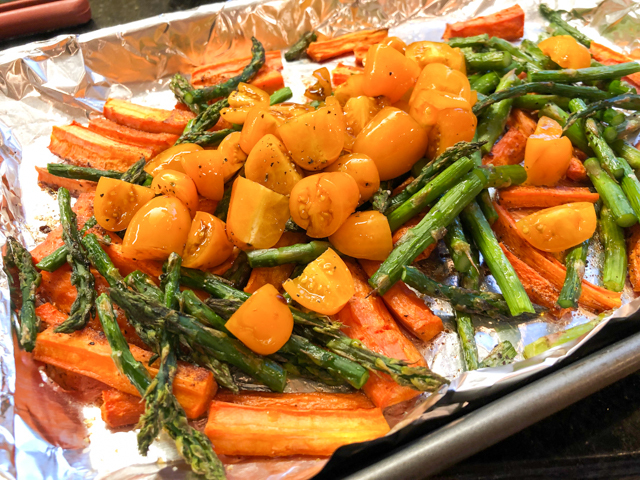 When the carrots are almost done roasting, add the asparagus and gently mix them. If necessary, add a touch more of olive oil. Roast the two veggies together for a final 5 minutes. Immediately add the fresh tomatoes, toss all veggies together, and place in a serving dish together with the farro. Adjust seasoning and serve. Comments: First, let me say that cooking farro as if it’s pasta (freely swimming in a huge pool of water), is another game changer. 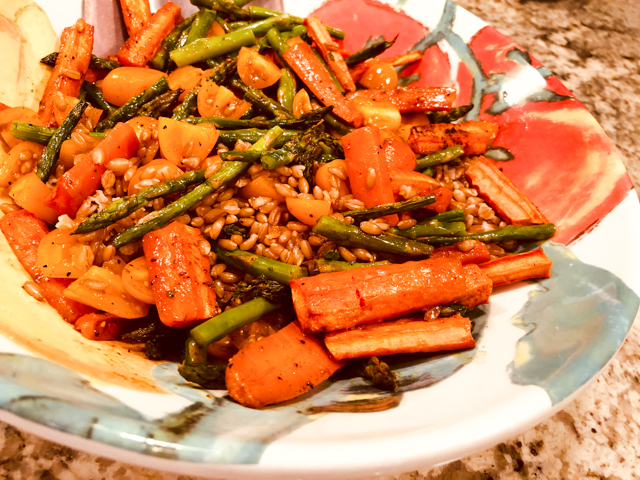 The problem with farro is that if you go by a specific ratio of water to grain, sometimes you hit the jackpot (that is the grain is perfectly cooked when the water is absorbed), but sometimes it is either too hard or mushy. This method takes all the guessing out of it, you cook, you test it as the cooking goes along, and when it reaches the level you like, it’s over. Drain it, and incorporate in any recipe you like. As to the veggies, I realize this is a little more involved than roasting a bunch of them together and calling it a day. The thing is, I am not too fond of the woody texture that the asparagus gets when simply roasted. With braces, the situation gets even worse. So I use my favorite method of preparing them, a very brief encounter with the microwave, and then finalizing in the oven. It gets the best of both worlds. FOUR YEARS AGO: Cauliflower Tortillas: Going low-carb and loving it! Interesting as this is quite my style of eating also and I love farro and use it often. I don’t use the microwave in cooking but usually steam asparagus: shall try . . . as far as the fresh component is concerned: yes, have not done that either, shall faithfully try and report back 🙂 ! Tomatoes and olives perchance . . .